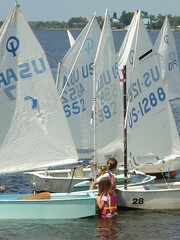 Last summer M took sailing camp and didn't like it much at all. It was great, she said, as long as there was no wind. Any hint of wind and she'd whine and cry until someone would get in her boat with her and help her out. She was young, just turned 7 and most kids don't start until they are 8-10 or so, so it wasn't a big deal. This spring we made it clear that she'd be taking the summer camp again this year. 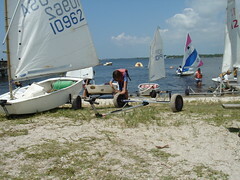 C helps out all summer, and I is also helping out some, so we're already going to be going there every day, and we want her to at least be somewhat comfortable on a boat, so much to her dismay she was signed up for camp again. To add insult to injury the camp started on her birthday! She wasn't a happy camper. The first few days she complained about getting up early, but every day she said she had a good time. 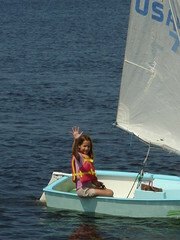 C said M never fussed about sailing, was always ready to go, and really caught on quickly. Her coach, Jim, said she was a star pupil, completely different from the girl he'd tried to teach last summer. Yesterday she complained that there wasn't enough wind! Whoa! I'm so proud of her for trying it again, giving it her all, and learning that she actually likes it. The racing team is going to a little regatta on Saturday and she's going to sail in it ... M, who a year ago never ever ever wanted to get in an opti again now wants to race ... her goal is to not finish dead last. Personally, I think she's already won.